At the right price, a good quality AK-47 can outperform a bad stock. "Price is what you pay; value is what you get. Whether we're talking about socks or stocks, I like buying quality merchandise when it is marked down." Actually, make that "whether we're talking about socks, stocks ... or AK-47 semiautomatic rifles with wooden stocks." Because today, dear investor, we're going to take a short break from the subject of investing in stocks (although that's our very favorite subject), to talk instead about investing in guns. You've all heard the stories about how some lucky folks make a fortune from investing in guns. To cite just one recent example, in April 2014, a .45 caliber revolver once owned by Wyatt Earp -- which probably cost about $20 when it was manufactured back in the 1800s -- sold at auction for the princely sum of $225,000. That there's a 1,124,900% profit, folks -- or a very respectable 7% annualized return on investment, dating from the presumed date of purchase. What are the chances of an investor in more common guns, such as the AK-47 rifle, which sells for less than $500 today, making anything like that kind of profit? Truth be told, profits like that earned at the Wyatt Earp revolver auction come but once in 150 years. As a general rule, guns such as the AK-47 don't perform quite as well as investments. But why not? In theory, the answer is that, unlike investments in land, gold, or for-sale historical relics, workaday firearms such as the AK-47 can be manufactured brand-new on factory floors. They're not finite resources that can be exhausted, but renewable resources that can be infinitely replenished. This tends to put a lid on prices. In one widely cited example, Foreign Policy magazine editor Moises Naim noted that in 1986 the price of an AK-47 in Kenya approximated the value of "15 cows." By 2005, that same AK-47 rifle could be purchased for just four cows. With each passing year, weapons manufacturers such as Smith & Wesson (NASDAQ:AOBC) and Sturm, Ruger (NYSE:RGR) here in the U.S., and their counterparts abroad, are sending new guns to market -- which tends to push "used" gun prices down. At least, that's how things work in theory, and on a global scale. At the local level, though -- within the regulated U.S. firearms market in particular -- things can work a bit differently in practice. I've compiled data provided to me by the good folks at BudsGunShop.com -- one of the Internet's largest retailers of new and used firearms -- describing the fluctuations in retail price of one popular AK-47 rifle model that Bud's has sold since 2007: the Romanian-manufactured Wassenaar Arrangement Semiautomatic Rifle. In less than seven years, an average AK-47 rifle's price grew by about 30%. It went from $371.55 in October 2007 to $484 at last quote. That is nearly 4% compounded annually -- not as good as Wyatt Earp's six-shooter, granted, but not a half-bad performance from a pretty common firearm. In fact, at one point -- just after President Barack Obama's election to a second term of office -- this workaday weapon fetched an incredible $1,249 per piece, a whopping 236% profit in less than six years. RGR Total Return Price data by YCharts. Contrary to what you might expect, S&W -- which, according to S&P Capital IQ, earns more than a 22% operating profit margin on the guns it manufactures -- has actually underperformed Bud's AK-47 model as an investment. 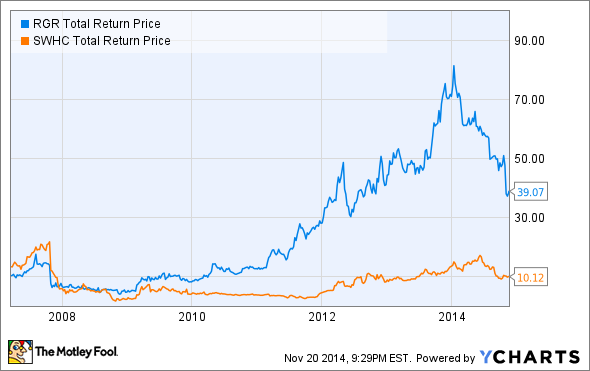 At last check, a share of Smith & Wesson is worth less money than it was worth seven years ago. Sturm, Ruger has done better, delivering tremendous returns to its investors -- as much as an eightfold profit at its height earlier this year. Even after its recent sell-off, shares of Sturm show an impressive fourfold return over 2007 prices. As a result, investors in Sturm, Ruger have outperformed investors in Smith & Wesson -- and investors in AK-47 rifles, too. Now, it's important to note that biggest movement in AK-47 rifle prices -- a 155% run-up from $519 to $1,249 -- came over the course of the 12 months between January 2012 and January 2013. That, if you recall, was an election year in which many gun buyers worried the federal government might take action to restrict sales of semiautomatic rifles such as the AK-47. Such regulation ultimately failed to materialize. But just the fear that it might sent AK-47 rifle prices soaring. And, if you ask me, the continuing threat of such regulation -- combined with new restrictions on Russian arms imports in the wake of Russia's invasion of Ukraine -- help to explain why the AK-47 continues to enjoy strong (if erratic) price support. Is that a good argument for investing in physical firearms, rather than in the stocks of companies that manufacture firearms? Maybe. But judging from how much better shares of Sturm, Ruger have performed, in comparison to Smith & Wesson and the AK-47 rifle price, it could just be an argument in favor of picking better stocks.